Connie Simms and Victoria Bainbridge report on the InfoAbend in Frankfurt. As one of the new Erasmus interns for BiG, I arguably could not have chosen a more exciting time to enter the fray, given the turbulent nature of the political negotiations that are currently engulfing the relationship between Britain and Europe. Yet despite the excitement that the current political climate brings, it can often be forgotten that for those British Citizens in Europe, it can be a time not of excitement, but rather of real worry. The decisions of the next few weeks will leave an indelible mark on people’s relationships, careers and lifestyle, with many currently suspended in a state of agonising limbo. 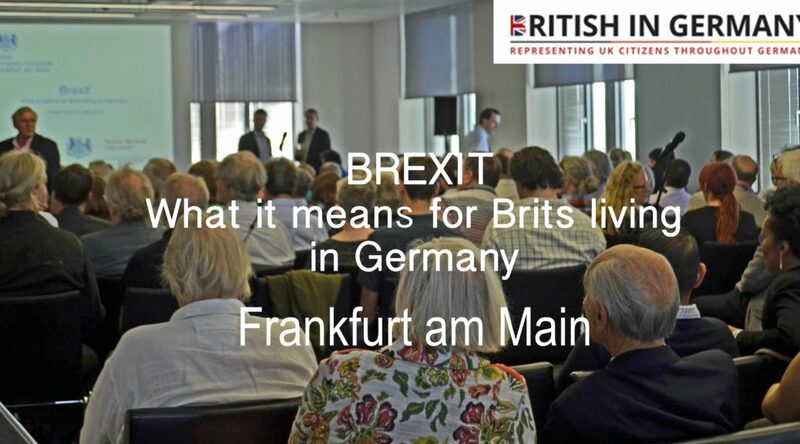 It was into this tense situation, where political meets personal, that I took part in my first British in Germany event in Frankfurt. The event took place on the 2nd of October 2018, in the prize location of the Grosser Saal in the Haus am Dom, for which the generous funding by the City of Frankfurt must be gratefully acknowledged. The event took the format of speeches by various organisation representatives including British in Germany, the British Embassy and the Deutsch-Britische Gesellschaft followed by a Q and A. At the time of the meeting, negotiations were ongoing, and as such the panel and speakers had the unenviable task of attempting to answer and engage with a topic on which there is little definitive information. This resulted in the speakers adopting a rather more ‘palliative’ approach, opposed to clear cut strategic advice, given the uncertain nature of the time. Uwe Becker, Bürgermeister und Stadtkämmerer of Frankfurt, encouraged affected residents to view his office as a ‘service centre’, in which people could find assistance with regards to clarifying their current rights and status. Although a wide range of topics were discussed, due to the individual nature of every British citizen’s situation in Germany, a topic that seemed to pervade the meeting was the question of citizenship. The prospect of applying for German citizenship was also sensitively discussed, and those who wish to take that route were reminded that crucially, in the event of a no deal scenario, German law works on date of decision, not application. As the Brexit date currently stands on the 29th March 2019, any citizenship application processes would need to have been completed by then. Another concrete piece of advice, echoed by the BiG representatives, was the importance of the audience ensuring that they were properly registered as resident in Germany and more importantly have proof thereof by obtaining a relevant Bescheinigung, in order to prepare for uncertain times ahead. By the time the meeting had progressed to the Q and A, the mood appeared one of resignation. Although this was ostensibly an invaluable opportunity to have questions answered by Embassy and BiG representatives, the frustration at the lack of concrete information available revealed itself in a couple of strained questions. Questions ranged from that on healthcare, to the question of British by descent, self employment, and cross border working. All panel members attempted to answer with the limited sources at their disposal, and David Hole (British in Bavaria) adopted an informative approach pointing out additional sources of information, with the ‘No Deal Checklist’ highlighted as a key guide to use. As the meeting drew to a close, despite the lack of solid hard information due to the tentative nature of current negotiations, the invaluable contributions of the panel appeared to have somewhat aided the concerned audience. For my first proper BiG event, there was certainly never a dull moment, and I came away bewildered at the fact that so many lives are currently in this state of uncertainty, in many cases disenfranchised from voting in the very referendum that has caused their personal state of limbo. It therefore reinforced my conviction in the work that BiG are currently doing in attempting to ring fence Citizens Rights, in order to provide some semblance of stability and constancy for these people who came to Germany as EU citizens and now face a precarious future. I would also like to use this opportunity to extend my thanks to David Hole for coming down to speak on behalf of BiG, to Victoria Bainbridge for her assistance in the events coordination, and most of all to BiG representative Amanda Diel, who was instrumental in creating and organising the event. She secured funding, coordinated the speakers, and participated on the day itself, something for which BiG is ever grateful to her for.